From the White Mountain area across the Mogollon Rim to the San Francisco Peaks lies an unbroken stand of Ponderosa Pine. The Kaibab Plateau north of the Grand Canyon continues this timbered strip into southern Utah. The highest point in the state is Humphreys Peak, located northwest of Flagstaff, with an elevation of 12,611 feet. Baldy Peak in the White Mountains of eastern Arizona is the second highest in the state with an elevation of 11,490 feet. The desert valleys of southwestern Arizona are an extension of the Sonoran Desert of Mexico, with elevations as low as about 100 feet above sea level in the Lower Colorado River Valley. Nearly the entire state is part of the Colorado River drainage basin, which empties into the Gulf of California. The world famous Grand Canyon lies within Arizona, extending southwestward some 277 miles from Marble Canyon near Lake Powell. The Little Colorado River and other tributaries join the Colorado River to form the main stream. The Grand Canyon varies in width from 4 to 18 miles, and depths from the rim to the river bed range from 2,700 to as much as 5,700 feet. This is an outstanding example of arid or semiarid land erosion by a major river whose source is in a more rainy area. Occasionally cold air masses from Canada penetrate the state, causing the Arizona climate to have temperatures well below zero in the high plateau and mountainous regions of central and northern Arizona. The lowest readings can dip to 35 degrees F below zero. High temperatures are common throughout the summer months at the lower elevations, where temperatures over 125 degrees F have been observed. Great extremes occur between day and night temperatures throughout Arizona. Because of the airs dryness, the daily range between maximum and minimum temperatures sometimes runs as much as 50 to 60 degrees F. During winter months, daytime temperatures may average 70 degrees F, with night temperatures often falling to freezing or slightly below in the lower desert valleys. Summertime in the pine-clad forests of Arizona may have afternoon temperatures of 80+ degrees F, while evening temperatures drop to 35 or 40 degrees F.
The Arizona climate makes the length of the growing season (period between freezes) varies tremendously over Arizona, averaging less than three months in some of the higher areas in the northern and eastern portions of the state. On the other hand, lower desert valleys sometimes have several years in succession without freezes. the state and sometimes bring heavy snows. Snow accumulation may reach depths of 100 inches or more during the winter. The gradual melting of this snow during the spring serves to maintain a supply of water in the main rivers and reservoirs of the state, which supply water to the desert areas of the lower Salt River Valley and the Greater Gila River Valley areas, which are extensively farmed. Summer rainfall begins early in July and usually lasts until mid-September. Moisture-bearing winds sweep into Arizona from the southeast, with their source in the Gulf of Mexico. Another important source of moisture for southern Arizona is the Gulf of California. Summer rains occur in the form of monsoons or thunderstorms, which result largely from excessive heating of the ground and the lifting of moisture-laden air along main mountain ranges. 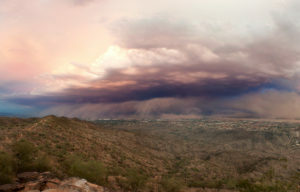 Strong winds and blowing dust often accompany rain during a monsoon. High winds accompanying heavy thunderstorms during July and August sometimes reach peak gusts of about 100 miles per hour in local areas, while tornadoes are reported on the average of about once a year. The average number of days with measurable precipitation per year varies from near 70 in the Flagstaff area to 15 at Yuma. A large portion of Arizona is classed as semiarid and long periods often occur with little or no precipitation. The air is generally dry and clear, with low relative humidity and a high percentage of sunshine. Flood conditions occur infrequently, although heavy thunderstorms can cause flash floods miles “down-stream” from where it is actually raining. Floods on the main rivers are mostly limited to the upper basins above storage dams. Flooding in populated areas is rare, but happening more in recent years. Since the Arizona climate is so stable, there are more than one million acres of land devoted to agriculture in the state. Nearly one-half of this lies in Maricopa County and about one-quarter in Pinal County. Yuma County is the third largest agricultural county, with about 18% of the total acreage in the state. Water for irrigation in the Phoenix area is obtained from storage reservoirs behind Roosevelt Dam on the Salt River, from Horseshoe Dam and Bartlett Dam on the Verde, Carl Pleasant Dam on the Agua Fria, and Coolidge Dam on the Gila River. The Yuma area receives its water from the Colorado River. Pumping of water from wells is common in Arizona. Extended drought periods sometimes cause curtailment of farming due to low water reserves. Agricultural activities in Arizona include raising cattle and sheep as well as some dry-farming of primarily grains, pinto beans, and fruit in the central mountain valleys of the state. Irrigated crops of cotton, alfalfa, grain, citrus fruit, melons, lettuce, and many vegetables are grown throughout the year in the lower desert regions. The Arizona climate has attracted numerous large industries, particularly in the Salt River Valley. A number of automobile and farm machinery manufacturers have established proving grounds in Arizona, in order to take advantage of the diversity of climate within relatively short distances. Mild winter temperatures in the desert areas of southern Arizona attract many winter visitors looking to escape the snow. During the summertime, the cooler climates of the Payson, Pine, Flagstaff, Prescott and the White Mountains are very popular. Rail, air, and roads serve the Grand Canyon, so the South Rim is kept open throughout the winter months. Because of the year-round pleasant Arizona climate, Arizona is a top destination for outdoor living. There are numerous national monuments, parks, and historic points for interest throughout Arizona. Winter sports are popular at Snowbowl near Flagstaff and Sunrise in the White Mountains. The deserts and forests of Arizona provide hiking, biking, horseback riding, camping, and hunting, and a host of other activities. And boaters and fishing enthusiasts have miles of scenic lakes, rivers, and streams to enjoy. All in all, Arizona is truly a spectacular state to live in.